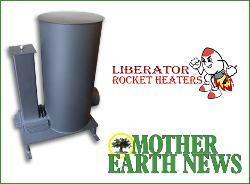 Contest: Enter for your chance to win a Liberator Rocket Heater! Enter for your chance to win a Liberator Rocket Heater! Prize: Liberator Rocket Heater **If you purchased the Liberator Rocket Heater between 7/2/18 and 11/15/18 and are the winner of the prize, you may be reimbursed for the cost of the Rocket Heater by Liberator LLC. Statistics: This contest was opened by 49 and entered by 3 ContestChest.com members. 6% of those who opened the contest, entered it.